Yes, they actually do have an “official port” where their 3 elected members meet at the library once a month. Now they have something to really talk about, two 1000+ foot cargo ships anchored off their shores! 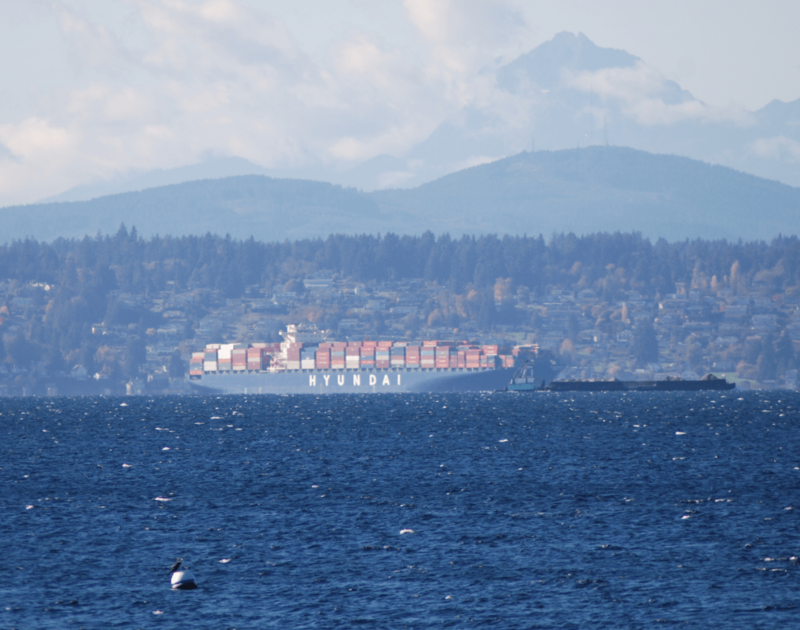 Long term neighbors along Beach Drive have commented about never recalling cargo ships of this size tucking in behind Blake Island. “The ship Hyundai Force was going south to Tacoma at 1:15 p.m. when it made a U-turn and proceeded slowly in a northern direction. When the ship made the U-turn it was just north of Three Tree Point. As it made the U-turn, it blew its fog horn several times. Clearly must be a response to the strong winds. The Hyundia Force and the NYK Constellation are most likely hanging out waiting for the contract embattled Longshoreman in Tacoma to pay attention to them. The work slowdown has been stacking up ships and cargo up and down ports of the West coast. The Facebook page for Pier Trucker Seattle pretty much sums up how the slowdown is affecting our local transportation and exports (warning for explicit language).